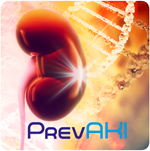 Winner of the 2016 Trials Group award, PrevAKI is a multicentre, prospective, randomised controlled parallel group trial, which will assess biomarker-guided implementation of the KDIGO guidelines in the prevention of AKI. Acute kidney injury (AKI) is a well-recognised complication after cardiac surgery and is associated with an increased morbidity and mortality. The KDIGO guidelines recommend the implementation of a variety of measures in patients with increased risk, but it is not clear whether this approach can prevent the occurrence of AKI in patients undergoing cardiac surgery or precisely how to determine risk. We hypothesise that a biomarker-guided implementation of the KDIGO guidelines reduces the occurrence of AKI in patients after cardiac surgery. The aim is to conduct a prospective, randomised, multicentre, controlled feasibility study including 280 cardiac surgery patients at high risk for AKI identified by a validated AKI biomarker test—[TIMP2]*[IGFBP7]. We propose to investigate the effect of the implementation of the KDIGO guidelines in patients at high risk for AKI after cardiac surgery compared to standard of care in the same patient population. The primary outcome will be the compliance rate (proportion of patients who have been treated according to the protocol). HYPOTHESIS: Implementation of the KDIGO guidelines in cardiac surgery patients at high risk for AKI identified by biomarker reduces the occurrence of AKI by approximately 15% compared to standard care. Data collection is set to begin in 2017. We plan to randomise 280 patients (140 per treatment arm) according to the power analysis and we estimate that it will take up to 8 months for the recruitment of the calculated patients. After identifying patients at high risk for AKI, patients will be randomised to a control group or to the intervention group. 6) Consideration of alternatives to radio contrast agents. Control intervention / reference test: Patients in the control group are treated according to the standard of care. The only two targets in this group are mean arterial pressure (MAP>65mmHg) and central venous pressure (8-12mmHg). Follow-up per patient: Up to 90 days after randomisation. Duration of intervention per patient: For 12 hours after randomisation. All data is anonymised and cannot be linked to individual subjects. The data is stored securely and all procedures regarding data management will comply with EU directive on data protection 95/46/EC. Results from the trial will be published by the PrevAKI nominated writing Committee. Investigators will be acknowledged as collaborators in the authorship of the paper and as such, listed in PubMed. Selected sites will be contacted shortly.